OMG Posters! 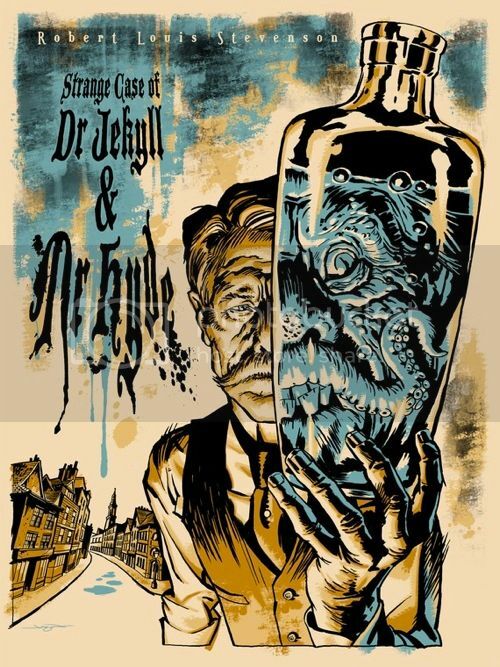 » Archive "Strange Case of Dr. Jekyll & Mr. Hyde" Book Show Print by Jason Edmiston - OMG Posters! Jason Edmiston is currently selling a few copies of his sold-out book show print for “Strange Case of Dr. Jekyll & Mr. Hyde”. It’s an 18″ x 24″ screenprint, has an edition of 50 (his copies are signed and numbered), and costs $40. Visit his Etsy Shop. No comments? I love this thing, would be all over it if it weren’t for an extremely large purchase. Great illustration and colors. Scored this one at G1988. All nice and flat. Not signed though. Jason does it again! Ordered my signed print through the week, will take a proud place in my collection of his work. As it stands there are 4 prints left on his etsy page… grab one while you can!! I like this concept a lot. Putting another face behind the glass bottle. That looks like something the art schools had me try to practice in college.